A few years ago, I moved into a new home and installed smart LED lighting throughout as part of an extensive remodel. In this post, I will share with you my personal experience living with smart lighting — including the benefits and the problems that I’ve encountered along the way. A few years ago, you would have been right. Smart lighting was pricey, complicated and — as my husband told me repeatedly after I installed it throughout our home — way more trouble than it was worth. 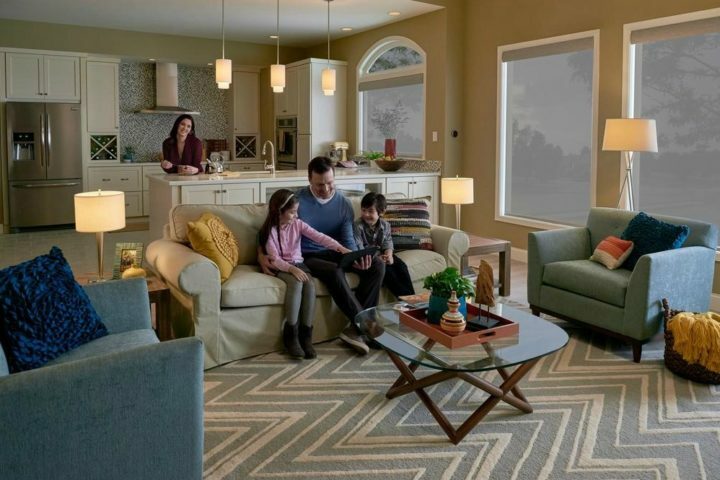 Today, however, plummeting prices, multiplying options, and seriously awesome new features are making smart lighting not only an easy addition to your household, but one that could save you money! All smart lighting uses LED light bulbs. LED lightbulbs are the most energy-efficient, eco-friendly bulbs you can buy. They consume 30 times less energy annually than traditional incandescent bulbs and last up to 25 times longer. Smart LED bulbs add to that energy saving because — thanks to their wireless connection — they can turn themselves on and off. With a smart lighting system, you can set a schedule to turn the lights off every morning when you leave, or let it use your smartphone’s GPS to determine that no one is home, and turn everything off. No more worrying about sucking up energy when you’re out and about! This all sounds fine in theory, right? But what’s it really like to live in a home with smart lighting? I installed smart lights throughout my home in 2013, and I can tell you firsthand the pluses, and occasional pitfalls, of this technology. Most of our setup is comprised of standard white LED smart bulbs. In a few main rooms, we splurged on some color-changing Philips Hue smart bulbs. For one particular room with a lot of lights on one switch, we decided to go with a smart switch and regular dimmable LED bulbs. We control all our lights with the Wink Smart Home Hub and Amazon’s Echo. Due to their smarts, the lights know when we’re home or not — so if everyone has left the house, all the lights will turn off. When one of us comes back after 5 p.m., all the downstairs lights turn on. We also have “scenes” set up through the hub’s smartphone app. Scenes activate all the lights at the same time either through a voice command or based on an action. Our family’s favorite scene is “Movie Time,” where the lights in the rest of the house turn off and our living room lights set to the perfect movie-viewing white light. To turn it on, we just say, “Alexa, trigger Movie Time.” The fact that no one has to get off the couch to do so has certainly improved the mood in the household! The app lets us set routines for the lights. I have a “Bedtime” routine that activates every school night at 7:30 p.m. The living room lights dim way down and the lights upstairs turn on, so my children know it’s time to get ready for bed. About 45 minutes later, the “Nighttime” routine kicks in. All the lights in the children’s rooms turn off, the nightlight comes on, and the living room lights turn up. I can also override these routines easily with my smartphone or on my Apple Watch — if we want to read just one more book before lights out. We have a motion sensor positioned by the stairs that turns the living room lights on dim if it senses motion between 10 p.m. and 6 a.m., which is when my daughter sometimes sneaks downstairs to get into bed with us. During the day, the same motion sensor is programmed to turn the lights on full brightness when someone walks past it — so we don’t even have to think about turning the lights on, it just happens. When we’re on vacation, I can set new, random routines so that the lights turn on and off as if we were home. I could just let our regular routines run, but I don’t want to waste too much energy — so I set up a simple vacation schedule for each day of the week, turning a couple lights on and off at random. Our smart lights are also connected to our smart smoke alarms. So if there’s an emergency, the color-changing lights switch to red (the best color for seeing through smoke) and the others turn to full brightness — helping us find our way out quickly without worrying about having to turn on the lights. My children love to do “dance off” competitions in our living room. We crank up the music and sync it with the color-changing bulbs. They flash different colors in time with the music, adding quite a lot more style to the performances. We also use our smart lighting to tell us things. I have “applets” set up through a free web service called IFTTT that turns my living room lamp blue if it’s raining outside, or flashes 4 times if I get an email from my boss. Every weekday morning when it’s time to get out the door for the school bus, all the lights in the kitchen and living room flash, giving the whole household the signal. That means there’s no need for me to shout at everyone that it’s time to go! Ask anyone with smart lights their least favorite thing about them, and I guarantee it will be this. When the power goes out and then comes back on, all the connected lights come on at full brightness. Yes, even at 2 a.m. This is a safety feature, but it is a very annoying one. It’s often a lot easier to turn off a light switch than pull out a smartphone or even ask Alexa to turn a light off for you. My children and my husband often choose this option — despite my pleas to the contrary — and once they do, that the bulb loses its power source and can’t be controlled by our smart systems until the switch is flipped back. You quickly get used to the convenience of smart lights, so when they don’t work, it’s frustrating. Over the years, however, I’ve tweaked our system to address our habits and we’re at the point where people rarely need to turn the lights on or off — because the lights automatically respond to them. One other solution to this problem is to replace your regular light switches with smart light switches. Or, as someone I know has done, put some duct tape over them! Okay, I know I said smart lighting is not that expensive, and it isn’t nowadays. But when I set up our system in 2013, I bought 6 LED BR30 dimmable light bulbs for our bedroom for $200 and paired them with a smart dimmer switch. Today, those same 6 LED bulbs would cost less than $25. That’s how much pricing has dropped! Some smart lighting is still expensive, though. If you want color-changing bulbs, you’ll pay a premium. You often need to buy a smart home hub as well — to keep everything connected. But if you’re mainly interested in energy savings, you could easily outfit an entire 3-bedroom house with LED light bulbs and smart switches for less than $400. If you’re switching from incandescent bulbs, you would make back that investment in energy savings within a year or two. For our family of 4, smart lighting has been an exciting addition to our lives, and while we’ve had some frustrations, the benefits have far outweighed those. The safety, security, convenience, and fun it offers makes it a smart choice for any family — along with the energy savings that help not only our budget but also the planet. I would heartily recommend a smart lighting system to anyone. I’m a tech maven and mom of two who writes about cool gadgets for the home. While renovating my dream home, I contribute to websites, edit two local newspapers, and write for Home Depot. My passion lies with technology, sustainability, and the intersection of the two. I aim to provide helpful info and tips that will guide you through the installation and setup for your own home. Get fun & simple Green ideas via email!